Introducing a Wedding Registry for your Photography . Easter may not be a conventional season for gifts, chocolate aside, but I’ve been developing some fantastic gift options, and one of which in particular I think you’re all going to love! One thing I’ve noticed over the last few years is that the typical Bride and Groom of today, since we’re all getting married later in life, don’t have a lot of material needs. If you’re the cooking type maybe your kitchen needs some better outfitting, but chances are one or both of you have set up house already for 5-10 years and doesn’t really need a department store’s help in such a big way. When we got married, we made a blog post for all the random stuff we needed and encouraged people to buy things used, but boy, if the option I’m about to present had been available to me I’d have jumped at it! I found a couple of photographers in the USA who’d developed this great solution to the big fat wedding budget, and it’s time for me to make the same offer to all the new brides and grooms I’ll be meeting in 2012, and maybe some I’ve met before! 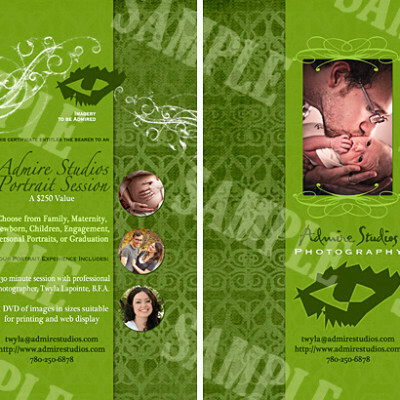 Introducing the Admire Studios Photography Wedding Registry! Ask me for your Complimentary Photography Registry. Let your guests know about it! I’ll give you a page on my site and business card size cards to include in your invitations with information on your registry. If you’ve had your Engagement Session before you send your invites, one side of the cards will have your photo! 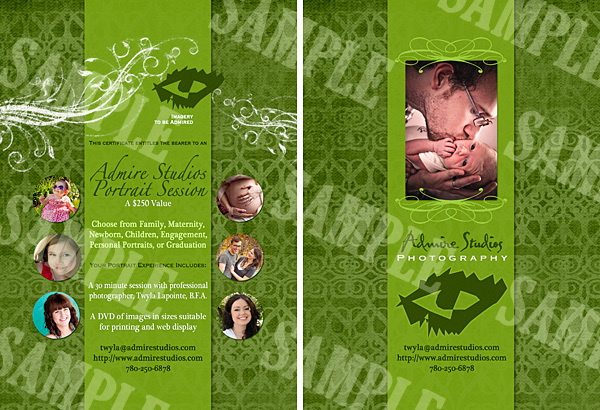 Guests will contact me and put money in any amount they choose towards your photography package and products. Your guests will be able to gift you with your wedding photography and your choice of prints, albums, and products! I have a ton more information on this on the Photography Wedding Registry page. If you like Admire Studios but your wedding budget is getting out of control, this is the way to go! Nice post! Many lovely people have bought my photo sessions as gifts for friends and family, most of them for newborn sessions with new parents. Recently, one family told me their session had been a gift and remarked that it was probably the most thoughtful and meaningful gift they had been given for their baby. Thanks a lot for posting!